Hamilton, Ontario was Sr. Dorothy’s birthplace, but she moved to Burlington following her adoption at the age of four, and lived there until she was 10. She has a younger sister and brother, an older sister and, until his recent death, an older brother – all of whom were adopted. After moving to Bracebridge, she attended school taking business and commercial courses and became a legal secretary. “At age 17, I asked my priest about Anglican orders and he contacted SSJD who advised that I had to be 21”. She married in 1973, had two sons and “was an at-home Mom and returned to work in 1989”. Her interests had included horseback riding, cross-country running, nature and the out-of-doors, church groups, Bible studies and volunteering at a retirement home. After her divorce in 1995 Sr. Dorothy, in frustration, explored a variety of jobs and activities “seeking the path God was calling me to”. A visit to the Convent was suggested and “I knew as soon as I entered the door”. Weekend visits in 2000 to experience the Community, “a talk regarding becoming an ‘Associate’ only it came out ‘Sister’ – and the process started”. Throughout her experience with breast cancer, Sr. Dorothy was very aware of much caring support from all levels of the Community. 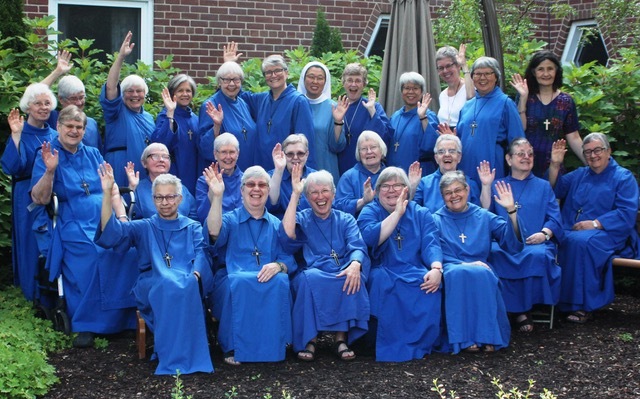 “One of the things I really like about Community is the way we work towards consensus – discussing and making decisions together – something the monastic life can offer the world”. A personal highlight for Sr. Dorothy has been attaining the status of “Grandma”!